Courage Campaign Blogger/activist Elliot Perry reports that LA immigrant and labor activists and UNITE-HERE made history Thursday. 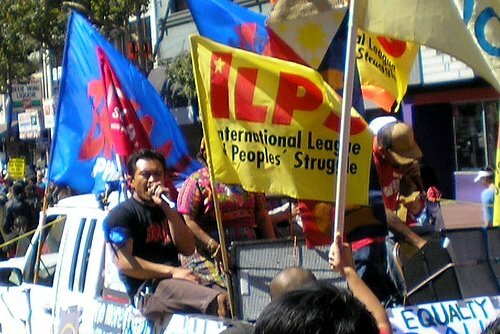 The LAPD called the immigrant workers' action the largest civil disobedience in Los Angeles in a generation and one of the largest in the city's history. The protest saw more arrests than any labor action in 60 years. The spirited and growing labor/community alliance reminds me of the militancy and unity of SEIU's 1990 Los Angeles/Century City Justice for Janitors campaign which was memorialized in the June 15th 1990 police attack on the peaceful workers and community allies. Perry says that contrary to some media reports there were more than 300 arrestees and close to 3,000 folks who marched beside them this past Thursday. See also LA Times reports. Organizers included the Somos De America (We Are America) coalition, Hotel Employees Union Local 11, and LAX area clergy. Deborah Burger and the California Nurses Association are turning the heat up to fight the "coalition of the corrupt" by terminating Gov. 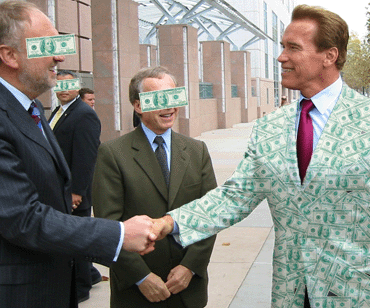 Schwarzenegger and stopping political corruption by passing Proposition 89 on November 7th. Good to see CNA, SEIU and others taking the lead on building a progressive movement to take back our state. Where's CTA when we really need them to build a broader community/labor alliance?... Even UTLA, the country's 2nd largest teacher's union, has endorsed Prop 89! Thanks to Duane Campbell's Choosing Democracy blog for this. The coalition of the corrupt—including Governor Schwarzenegger, much of the Legislature, and California’s high-paid lobbyists—have ganged up to defeat bills that would improve California’s healthcare, education system, and environment. They usually like to kill these bills in the dark of night—but we’re bringing it into the light this Tuesday at Noon with a special bill-vetoing ceremony. Yes on Proposition 89 and Stop Political Corruption! Arizona schools - Goldwater Country - RIP bilingual education? Barry Goldwater - "In your heart.. you know he's right"
In 102 degree weather...deep in the heart of Goldwater country - Phoenix, Arizona - I am visiting schools, dialoguing with hundreds of other school board members, Superintendents and policy wonks at the Council of Urban Boards of Education's 38th Annual Conference. Despite the passage of Arizona's anti-bilingual education Proposition 203 in 2000 and the rigidity of NCLB some schools keep trying to strengthen bilingual education and arts and music programs here in the greater Phoenix metropolitan area. Only 7 dual language immersion programs remain according to local advocates. For more history on what school desegregation activist/scholar Angelo Ancheta calls the "intersection of nativism and racism" in education policy - see former Education Week reporter and NABE director James Crawford's language policy website. To beat the blistering heat early this morning about 20 of us visited the 50 year old Valley View Elementary School [K-8] in Phoenix's Southern Mountain area. This heroic school has managed to continue its dual language immersion programs despite Prop 203 by offering Spanish as a foreign language to all its K-3 students and then offering to its 4th to 8th graders an excellent "delayed entry" dual language immersion program. The school is 85% Latino, 13% African American, and 50% English learners. I was also impressed with the principal and teachers' focus on using achievement data as a diagnostic tool to support student learning with a tool called Data in a Day and a child-centered approach to school reform. The school's integration of music and arts into the curriculum and various partnerships with businesses and community partners were outstanding as well. 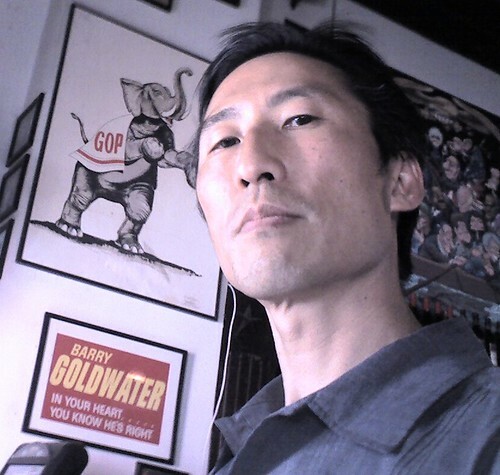 Lastly, I snapped the self-portait photo above in a bar near my hotel - the GOP and Goldwater icons at first made my skin crawl - but it made me realize how deep I am in the birthplace of one of our country's historical bastions of conservatism, but also the base of our current day gun-toting vigilante 'minutemen' and Sen. John Kyl who are carrying on the bigotted Goldwater tradition. "In my heart"... I know they are wrong - and from my discussions with the students, parents and teachers at Valley View, I know we have to keep up the fight for human rights for immigrants, for adequate funding for our schools, and for educational justice for everyone. 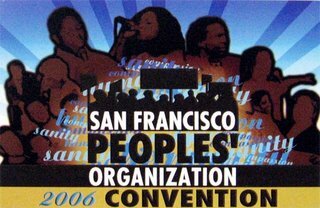 As I fly off to Phoenix for an urban schools/immigrant students gathering of educators today, hundreds of San Francisco grassroots and labor activists will be uniting for the 2nd Annual SF People's Organization convention on Saturday September 30 at St. Mary's Cathedral. The workshop will include strategizing on how to build a movement to change our school system and concrete things folks can do today to fight for educational justice; and a useful case study of our Jan. 2002 SFUSD Racial Justice/Educational Equity policy which requires annual 'Equity' Reports among other requirements which I drafted with the help of Tammy Johnson of the Applied Research Center, folks from Californians for Justice and local activists like Jeremiah and Karen from many local grassroots groups in 2001. In 2 short weeks T4SJ will be holding our 6th annual educator’s conference "Teaching for Social Justice: From Moments to Movement on October 14th at San Francisco's Mission High School. Highlights include a keynote by Wade Nobles and a session on how we can support the Oaxacan Teachers' struggle. At the federal level in Mexico, the current discourse signals an imminent arrival of Federal Police Forces in Oaxaca. The feds claim that, if federal forces are sent to Oaxaca, they will only maintain a presence on the outskirts of the city, to "ensure civilian safety." However, it is widely known that local PRI-sympathizing groups can be mobilized to provoke a confrontation with the sectors of civil society partiapting in the popular movement, which would justify the entrance of the federal police. Please call or send faxes and emails to President Fox and to Secretary of Interior Affairs, Carlos Abascal, demanding the immediate withdrawal of threats to send police forces into Oaxaca, and the immediate resignation of Oaxacan governor, Ulises Ruiz Ortiz. Write in Spanish. Write in English. Just write, or call, or both. noise. Spend the night out front if you have to. 06sept4 cpa allimmigrantsunite, originally uploaded by ericmar. The Nation, Wiretap and Alternet feature an excellent piece today on immigrant rights organizing and mobilizing, especially among younger activists by Paloma Esquivel. Young, U.S.-born Latinos who took to the streets in massive numbers to push for immigrant rights are hoping to become a potent political force in this year's midterm elections and beyond. Pundits may decry the political disengagement and cynicism of the Jon Stewart generation, but students, young workers and young families have played a major role in mobilizing immigrant communities to become politically engaged. Across the country, they led street mobilizations, school walkouts and teach-ins. As one 16- -- year-old who walked out of school in Santa Ana, California, told the Los Angeles Times, "We don't want to just read about democracy in our textbooks. We want to experience it firsthand." 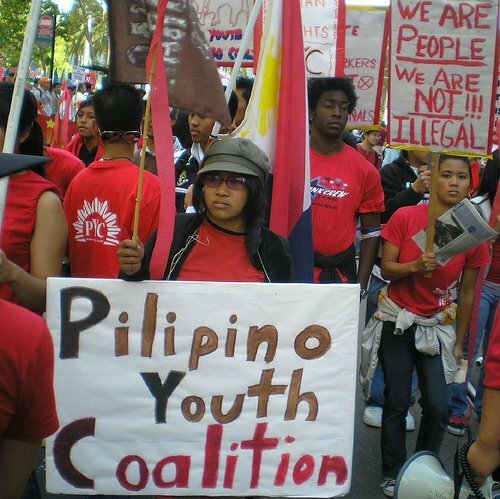 Now young organizers are taking their influence from the streets to the polls. 8 Berkeley High School students visited my Asians in America class this afternoon at SF State as part of a project coordinated by my colleagues Antwi Akom of Africanna Studies and Mathew Shenoda of Ethnic Studies. 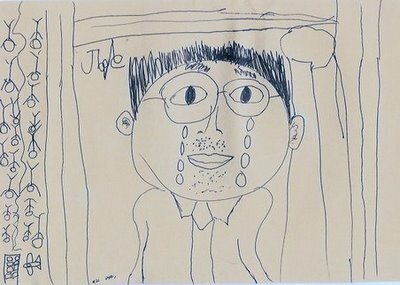 The students told me and my class about their struggles to get through the school system and their hopes of going to college. They made me think about one of my colleagues NYU Professor Pedro Noguera, a former Berkeley School Board Member and his ongoing work to create a more equitable school system for students from Berkeley High to New York City and San Francisco's communities of color. See Mike Klonsky's small talk blog for more on Pedro's latest book Unfinished Business: Closing the Racial Achievement Gap in Our Schools , co-edited by another one of my former colleagues Jean Yonemura Wing, now working with Oakland Unified but, like Pedro, a longtime social justice movement veteran as well. Lastly, to round out the Berkeley High connection, last weekend I attended an excellent workshop on teaching about Modern China for high school and college students organized by the KQED Education Network. One of the main presenters at the workshop was another small schools movement leader and longtime Berkeley High School teacher Rick Ayers. For more on Rick's history - of Chicago-area antiwar activism, weather underground notoriety, dating Saturday Night Live's Gilda Radner and Social Justice teaching and advocacy - see the Berkeley Daily Planet's June 2006 feature on his work. 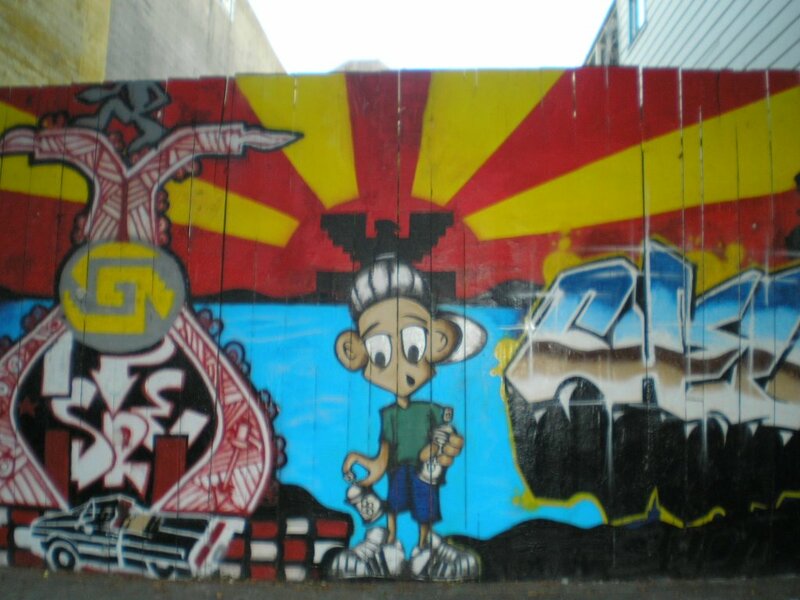 See also his writing on the small schools movement in the SF/Berkeley East Bay area. See also his 1998 book Teaching for Social Justice. Props to KQED's Education Network 's Alison Lee Satake and Elaine Shen for developing a great workshop with excellent teacher resources. For more info on their upcoming workshop. As the United Nations delegates gathered Tuesday in the big apple, United for Peace and Justice, one of the major anti-war/social justice coalitions, rallied thousands tying up the major arteries and intersections of NY City to protest the illegal war and occupation of Iraq. In this backdrop multi-billionaire Eli Broad, the worlds 103rd richest man, and his Broad Foundation awarded Boston Unified School District the 2006 Broad Prize for Urban Education, the largest education prize in the country. The 200 or so of us assembled at NY's Museum of Modern Art were also joined at the festivities by two former U.S. secretaries of education, Rod [teachers are terrorists] Paige and Richard Riley, as well as former President Bill Clinton who delivered perhaps the world's shortest keynote ever address - a whopping 4-5 minutes. 'The World is Flat' author Thomas Friedman last year gave an insightful and relevant lecture on globalization and its implications for US schools at last year's luncheon. So, Clinton's extreme brevity caught many of us by surprise. I was happy to congratulate recently retired Boston Superintendent Thomas Payzant for his district's great work over the years. Our district [San Francisco Unified] had been a finalist last year when Norfolk VA won the prize, but Boston has been a finalist for the Broad Award every single year. Payzant seemed as if he had expected his district to be chosen this year. The day before, I joined many education policy folks at the Hilton Hotel for a symposium on best practices for urban school districts. Many panels were filled with VIP superintendents, corporate-sector education philanthropists [Gates Foundation, Business Roundtable, etc. ], but only a handful of teachers from NY's UFT and a few teacher's union heads from a few school districts. The type of superintendents promoted by Broad, the Business Roundtable and the big business philanthropists included many of the nation's 'superstars' like Miami's Rudy Crew, NYC's Joel Klein, our former SF Superintendents Arlene Ackerman and Ramon Cortines who is now advising LA Mayor Antonio Villaraigosa, and many others. Oakland's despised former state overseer Randy Ward who was recently ousted from his position according to the East Bay Express was also featured on a prominent panel as well. For the historical background on Oakland parent and students' fight for educational justice see the Data Center's report on school district takeovers in California. The Broad Foundation also acknowledged their 3 'cohorts' of Broad interns who are generally Ivy league and elite business and education school grads who have been placed in urban districts throughout the country like SF and Oakland over the past few years. SF Hotel Workers Rising! Reach Settlement - No Strike! 06sept4 local2winningtogether, originally uploaded by ericmar. SAN FRANCISCO, CA - 9/13/06 - San Francisco hotel workers announce that their union, UNITE HERE Local 2, has reached agreement on a new contract with the city's leading hotels. 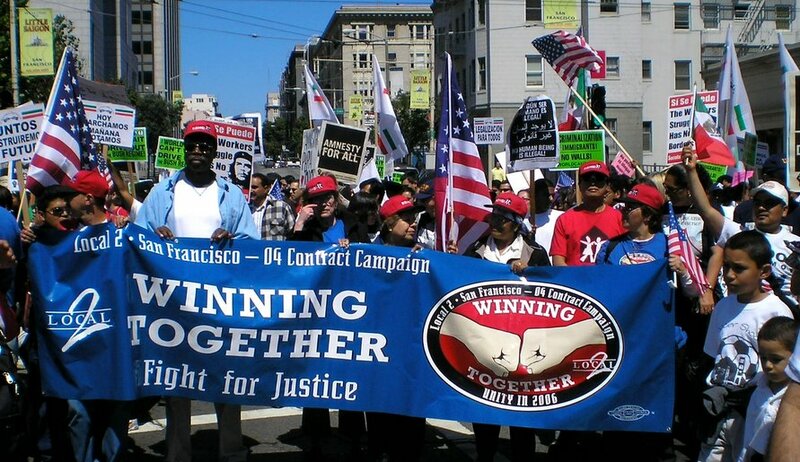 UNITE HERE Local 2 negotiated for over two years with thirteen San Francisco Class A hotels in the Multi Employer Group, and went without a contract during that time. The union acheived its major goals, including card-check neutrality to make it easier for workers in non-union hotels in San Francisco and San Mateo Counties to join the union. Workers won substantial wage and benefit increases, and defeated an attempt to make them accept a two-tier arrangement giving new workers a lower wage and benefit standard. The union accepted no concessions. Negotiations are part of a national campaign, Hotel Workers Rising, in which hotel unions in many cities are negotiating new contracts this year. San Francisco workers took a strike vote in August, along with workers in Hawaii, Chicago, Toronto and Monterey. When the Local 2 contract expired two years ago, the union wanted a new agreement that would expire this year, so that it would be able to negotiate at the same time other hotel locals were bargaining in other cities. The MEG refused, and Local 2 struck four hotels for two weeks. The MEG then locked workers out of all its hotels for nine weeks. 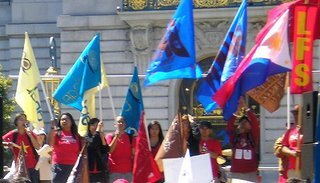 Employers were finally forced to lift the lockout, with the intervention of Mayor Gavin Newsom, but the union had to continue to work without a contract until the completion of the new agreement. Local 2's bargaining committee recommended the contract unanimously, and the membership is expected to ratify it by a large majority. My 6 year old Jade quickly sketched this sad drawing of me at dinner this evening while my partner Sandi and I watched the beautiful red sunset on the 5th Anniverary of 911 at the Beach Chalet on San Francisco's Ocean Beach. I had visited ground zero in Manhattan a few months after the tragedy in 2001 and will be going back later this week for an urban schools awards event. I plan to go back to ground zero again and mourn the loss of life in the US and in Iraq in the past 5 years. The week of September 11th has always been a 'teachable moment' for my Ethnic Studies classes at San Francisco State because there are so many new and interesting resources available to teach about broader issues of racial justice, civil rights and civil liberties, and the ongoing struggles for democracy, constitutional rights and immigrant rights today. Thanks so much to Teaching for Change and others for posting such great alternative 911 resources for teachers like me. For my Ethnic Studies and Asian American Studies students I always use San Francisco Filmmaker Lina Hoshino's excellent 2004 film - Caught In Between: What to Call Home in Times of War which links post 911 America with the WWII internment camp experience by highlighting post 911 multiethnic community activism and solidarity and the 2002 Tule Lake Internment Camp Pilgrimage. The film also features veteran community activists like Yuri Kochiyama, WWII Draft Resister Mits Koshiyama, Justice for Latin Americans activist Grace Shimizu, and the NOSEI Network's Lisa Nakamura. I also use a number of shorter readings from ColorLines Magazine, WarTimes, National Network for Immigrant and Refugee Rights, and articles from 2 relatively new South Asian American groups ASATA and SAALT. In past classes I have used songs from Michael Franti/Spearhead or local hip hop artists like Kiwi as well to bring out artists' responses and perspectives on what 911 means to us today. 6th annual educator’s conference "Teaching for Social Justice: From Moments to Movement"
My 6 year old and I are off to the annual Power to the Peaceful Concert organized by grassroots activists and peace and justice loving folks from our neighborhoods. 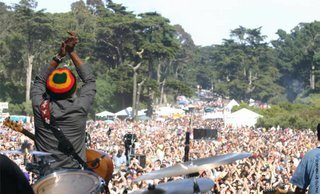 Props to Michael Franti, all the bands and organizers here for making it family friendly and doing their thing for peace and justice in our City and throughout the world. hands, lots of hooks, kind of U2-sounding with typical spearhead soulful/reggae backdrop. the free power to the peaceful fest in golden gate park is coming up fast on Sept. 9th - PPTTP i think is really is the closest gathering we have to the 'be-ins' and summeroflove-ish free festivals we have had over the years here in Golden Gate Park. Who is funding the No on 89 campaign? The California Chamber of Commerce is busily building its team of Sacramento insiders desperate to support the status quo-and ignore the corruption that troubles so many voters. Their first major donor has stepped to the plate, with Mercury General Corporation donating $100,000 to the No on 89 campaign, paired with another $100,000 from George Joseph, the company’s CEO. Yes on Clean Money Elections! 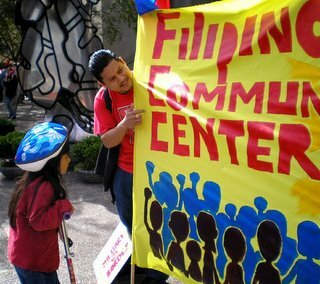 For several years now the League of Filipino Students [LFS] and the Excelsior-based Filipino Community Center [FCC] have helped lead many of the recent community struggles around anti-displacement, immigrant rights and peace and justice issues in our SF Bay Area. along with folks from SF City College, Skyline, Bay Area High Schools and many of my student and teacher colleagues at SF State have been an inspiration to learn from and work with. I took this photo below of my daughter Jade getting a real 'political education' from FCC activists and others at the Immigrant Rights/Labor Day March in SF. Despite ongoing terror and assasinations of their leaders in the Philippines by the "fascist US puppet regime of President Gloria Macapagal-Arroyo" LFS and the grassroots people's organizations continue to build international solidarity and give leadership to many of our struggles here in the US. I ask again, senator: Does it blow your mind to know that the people you presumed are only "foreigners" in this land - the people you mockingly "welcomed" to this country - are not any more of a guest in this land than you are? That they have contributed to this nation's growth in many, many more ways than you can possibly imagine? Senator, Welcome to MY America where people of your ilk continue to benefit from the labor of the "colored people" and yet continue to trample on their dignity, continue to grind their rights into the ground, continue to demonize them, label them with racial slurs, exclude them from opportunities and keep them in "their place". Senator, Welcome to MY America where every attempt by your ilk to break the spirit of the minority has miserably failed. Senator, Welcome to MY America where not all Indians are New York city cab drivers or motel owners or Seven-Eleven cashiers. Where not all chinese-Americans run chinese take-out joints and not all Indian-Americans run Dunkin Donuts and subways. Senator, Welcome to MY America where indians, who were not allowed to own land only some 50 years back now have a median income that is almost twice that of the national average and 1 in every 10 among them is a millionaire. Senator, Welcome to MY America where 1 in every 3 faculty member in engineering departments across the US is an Asian-American and 1 in every 40 Indian-American is a doctor. Senator, we made America as much as America made us. We are America as much as America is us. Sen George Felix Allen, welcome to 21st century America. Thousands of working families, most from immigrant communities and representing unions and grassroots organizations, commemorated Labor Day in San Francisco with a massive march from the Ferry Building to City Hall. For more photos go to www.flickr.com/photos/ericmar. Hotel Workers Rising - marchers called for support for Local 2, UNITE-HERE workers who have been fighting for a contract for 2 years. A successful civil disobedience this past week was followed up with massive support for the workers today. See http://www.unitehere2.com for how you can support the workers. 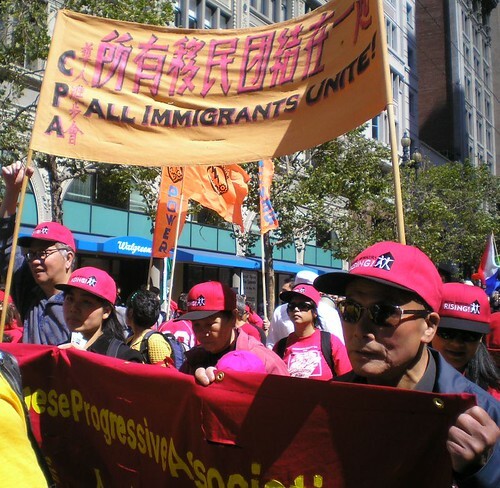 The Chinese Progressive Association joined the May 1st Alliance for Land, Work and Power which also includes Mujeres Unidas y Activas, the SF Day Labor Program, POWER, St. Peters Housing Committee and others. The alliance was a part of a larger "Anti-Imperialist" contingent led by a number of revolutionary and progressive Filipino community groups, APICAW [Asian Pacific Islander Coalition Against the War], the progressive coalition at SF City College, and Deporten a la Migra. Teachers, students and parents were out in force as well. 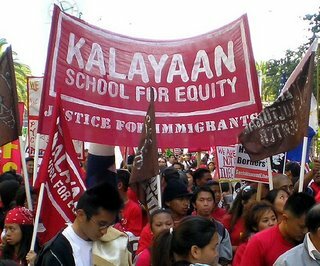 Teachers for Social Justice, United Educators of SF and many others marched in various contingents chanting. "Support Education! Not Deportation!" SF Mission District Mural - 24th Street near Capp St.
See ARC's 'racial cut' on the demographic analysis of the recent Census Data released to the mainstream media earlier in August - the Explosive Growth in Communities of Color. I really enjoyed ARC staffer and educational justice leader Tammy Johnson's great review of Spike Lee's documentary on New Orleans/Katrina and the systematic racial and class oppression of the people of the gulf coast region. Sen. George Allen's (R-Va.) "macaca" scandal. Sen. Conrad Burns (R-Mont.) joked about how a "nice little Guatemalan man" fixing up his house might be an illegal immigrant. A leading congressional candidate in Florida said he knows, "from my own experience, that blacks are not the greatest swimmers, and may not even know how to swim." to racial profiling at airports. Pat Buchanan's new book argues for "an immediate moratorium on all immigration," in order to preserve the dominance of the white race in America. And in one you may not have heard about, a Baptist church in Mississippi voted out a 12-year-old boy who "asked Jesus to live in his heart" -- because the child is biracial and church members didn't want the black side of his family attending with him. 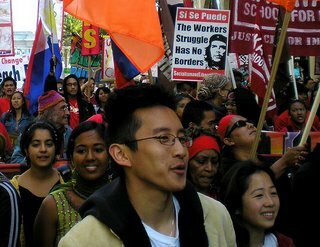 Lastly, congratulations to Rinku Sen who has just been chosen as new head of the 25 year old Applied Research Center, replacing founding director Gary Delgado, a longtime social justice movement leader and founder of the ACORN and the Center for Third World Organizing in Oakland. Go Rinku!